Black cumin seeds (Nigella sativa) have been used therapeutically for over 3,300 years, since their first reported discovery in Egyptian Pharoah Tutankhamun’s tomb. Part of the buttercup family, the seeds are dark, thin, and crescent-shaped when whole. Cleopatra used it as a beauty treatment. Queen Nefertiti used black seed oil to bring luster to her hair and nails. Hippocrates used it to cure digestive and metabolic disorders. Archaeologists even confirmed King Tut kept a bottle of black cumin seed oil in his tomb –for use in the afterlife. It comes as no surprise that black cumin seed oil has also been used by practitioners of Ayurvedic and Chinese traditional medicines for thousands of years for a similarly endless list of conditions, from migraines to diabetes to cancer. In recent years, it has been put to the test and several scientific studies confirm its long reported health benefits. With proven effectiveness against the most life-threatening culprits, including but not limited to cancer, bacteria, viruses, ulcers, diabetes, chronic inflammation, liver & pancreatic disease, fungus, molds and deadly parasites…. Black cumin may be the most “all-in-one” health provider in existence. Since 1964, there have been 458 published studies involving black cumin – confirming what Middle Eastern and North African cultures have known for thousands of years – that black cumin is nothing short of a miracle all-healing remedy. Black cumin is one of the earliest cultivated plants in human history, meaning it was one of the early providers of life. These black seeds contain over 100 chemical compounds and some of the ingredients are yet to be discovered and identified. The main active ingredient in black seed oil is crystalline nigellone. The seed oil also contains beta sitosterol, thymoquinone, myristic acid, palmitic acid, stearic acid, palmitoleic acid, oleic acid, linoleic acid, arachidonic acid, proteins and vitamins B1, B2 and B3. The seeds also contain calcium, folic acid, iron, copper, zinc and phosphorous. 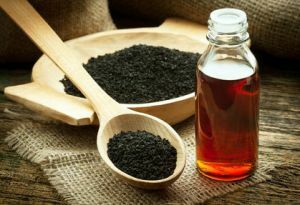 The high content of phytosterols found in black cumin oil is also necessary to the human body for natural production of hormones, pro-vitamin D and bile acid – aiding in a prevention of endocrine disorders, immune deficiency and the #1 killer – cardiovascular disease. As a result, these tiny black cumin seeds provide an all-around super multi-vitamin of nutrition. Black cumin does this by helping to stimulate the production of bone marrow and cells throughout the immune system. It increases the production of interferon, protects normal cells from the damaging effects of harmful invaders, destroys tumor cells and increases the number of antibody producing B cells within us. In turn, black cumin supports the entire body. Its immune-building properties and active compounds have been proven to fight a never-ending list of diseases and autoimmune disorders, via the boosting of the body’s immune cell production, bone marrow and natural interferon. Even for people in the best state of health, consuming black cumin regularly can greatly increase vitality and well-being. A woman in Yemen, suffering from stage 3 cancer, longed for natural treatment. She was advised to take black cumin seeds with honey three times a day, in addition to garlic and honey. After three months, her cancer completely disappeared. The woman continued consumption of these nutrient-rich foods even after illness had diminished. Not only has black cumin been demonstrated to improve a variety of cancer situations like hers, but researchers at the Cancer Immuno-Biology Laboratory in South Carolina also found that black cumin helps stimulate the activity of neutrophil granulocytes – the most abundant type of white blood cell in the body. These neutrophils target cancer cells before they multiply, and eliminate them before they can develop into harmful tumors. Nigella sativa has been well-documented for its ability to fight many forms of cancer, including pancreatic cancer. Right now, pancreatic cancer is the fourth leading cause of cancer deaths in America, because the survival rate after five years of conventional cancer treatment is sadly only 4 percent. A study conducted at Kimmel Cancer Center, Thomas Jefferson University, Philadelphia revealed that Nigella sativa DESTROYED pancreatic cancer cells – with an incredible 80 percent cancer tumor cell death! It also stopped the gene transcription process so cancer cells could not replicate! The magic ingredient in Nigella sativa appears to be thymoquinone. Researchers believe thymoquinone holds promise as a preventative strategy both for patients who have already gone through surgery and chemotherapy, and as an important prevention strategy for others, especially those who are genetically prone. The utmost vitality doesn’t mean anything if you don’t maintain a HEALTHY HEART. 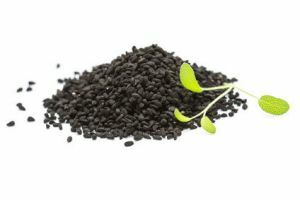 Black cumin benefits the heart and cardiovascular system in a variety of impressive ways… Rich, unsaturated omega 6 & 9 acids and phytosterols help fortify and increase the elasticity of blood vessel walls, decrease capillary fragility and permeability, prevent thrombus formation, and decrease arterial pressure. 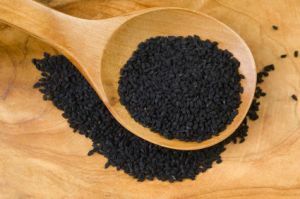 Black cumin also assists in the decrease of blood cholesterol – preventing formation of dangerous atherosclerotic plaque, as well as preventing development of inflammatory elements in the overall cardiovascular system. Additionally, black cumin has been used for tachycardia, bradycardia, hypotension, hypertension, as well as other various heart diseases. In 1989, an article about phenomenal properties of black cumin was published in the Pakistani Medical Journal. Then in 1992, research of the antibacterial properties of black cumin in comparison with strong antibiotics was carried out in the medical department of the University of Dhaka in Bangladesh. The facts were very facsinating – black cumin oil demonstrated itself as a MORE EFFICIENT remedy against certain types of bacteria, including those which most strongly resist antibiotic drugs. Black cumin has been shown to contain the following properties, which help define its powerful medicinal value. The “OIL” is the most effective form to consume because it is more concentrated than whole, unpressed seeds, and is more readily assimilated. Also, because of its potent, absorbable concentration, only 1/2 teaspoon is needed per dose. Most health experts and natural physicians recommend taking 1/2 teaspoon of the oil two to three times per day for therapeutic effects, on an empty stomach/before meals and at bedtime. It can also be taken once per day for a healthy maintenance dose or as a preventative measure. Black cumin can have sedative effects for some, and because the oils have bile-expelling characteristics, in my opinion, it is best taken in the evening – unless utilizing 2-3 times per day for therapeutic benefits. You can take the oil on its own, mixed in water or juice (great with raw honey), or added to warm tea – like herbal chai, etc. Many people have also added a small amount to their face and body creams, with phenomenal results. It is also beneficial topically for burns, psoriasis and other skin disorders. Mix with honey and/or garlic for a great tonic for effective immunity-boosting during cold and flu season. Black cumin should be taken daily as a preventative measure for all illnesses, and life-long vitality. Where to get 100% PURE black cumin oil? First, it must be (true) black cumin oil – purely from Nigella sativa. You also only want to purchase organic, pure-pressed oil that is completely free of all additives – and should be stored in a light-protective and air-sealed Miron bottle. Currently, Activation Products is the only supplier of pure black cumin oil that is matched to these standards. The amazing health effects listed above are what inspired our team at Activation to produce pure black cumin oil. I highly recommend you consume it regularly. This is one of my personal staples, and I know you’ll enjoy it as much as I do! Hey Buddy!, I found this information for you: "Black Cumin – A Life Elixir for all Illness Except Death". Here is the website link: https://www.thealternativedaily.com/black-cumin/. Thank you.